The illustrations and text in this section provide the names for the external parts of adult bees. Many structures are simply labeled in the illustrations. Those that do not appear in the figures, or for which discussion or explanation is needed, are treated in the text, with the preferred terms appearing in boldface type at the places where they are defined or explained. The hope is that the illustrations plus the text will encourage uniformity ofus-age in future work. The emphasis is on features that vary among kinds of bees; very few terms are explained or illustrated for structures that do not provide useful diagnostic characters in one or more bee taxa. thophora. There is no need to repeat here the details of morphology presented in some of these works, but the terminology to be used in subsequent parts of this book requires some explanation. It is that of Michener (1944), modified in various ways. Many of the structures referred to in the systematic parts of this book (Sections 33 to 121) are labeled in Figures 10-1 to 10-15. These figures are mostly diagrammatic, intended to illustrate a maximum number of bee structures; only a few are based on particular bee species or genera. Terms that seem obvious from a perusal of these figures are not further described here. For fuller accounts, see Michener (1944) and the other morphological studies listed above. Figure 10-1. 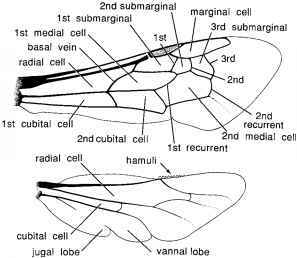 Diagrams of a bee's head, showing major structures. a, Anterior view; b, Posterior view. From Michener, McGin-ley, and Danforth, 1994. ■condylar ridge "condylar groove apex of the mandible, and the outer ridge, which is the next ridge above the condylar ridge on the outer surface of the mandible. The terminology for parts of the labrum is often confused by the use, in the genus Andrena, of the term process for the basal elevated plate. The term process is misleading because this plate does not project, as one expects of a process. In other bees, e.g., the Panurginae (see Ruz, 1986), the same structure is called the basal area of the labrum. Use of the word "process" in the sense of basal area is further confusing because in some bees, especially the Halictidae, there is an entirely different process on the apex of the labrum, here called the apical process of the labrum. For descriptive purposes the face is often divided into ill-defined areas, as indicated by dotted lines in Figure 101. 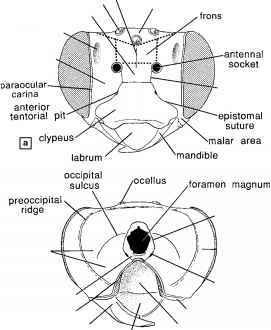 These are the two paraocular areas, the supraclypeal area, the frons or supra-antennal area, and the vertex. The malar area (or malar space) is between the eye and the mandible; its length is the shortest distance from the eye to the mandible (Fig. 10-2); the width of this area is the width of the base of the mandible. 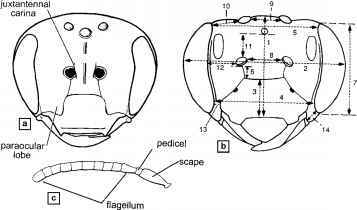 Figure 10-2. a, Diagrammatic lateral view of a bee's head; b, Outer surface of mandible. From Michener, McGinley, and Danforth, 1994.
products and their functions are unknown. In many bees that lack distinct facial foveae there are nonetheless areas of differentiated cuticle, presumably homologous to foveae. Such areas are usually more sparsely and less coarsely punctate than adjacent areas, and frequently differ in surface microstructure and in color (usually black). Thus every intergradation exists between complete lack of foveae (as in Megachilidae and most Halictinae) and distinct, depressed foveae. In keys and descriptions I do not indicate the presence of foveae unless the area is sufficiently depressed that at least one margin is distinct and the other indicated by a sharp change in texture or color. The antennae arise from antennal sockets, sometimes called alveoli. For simplicity, the terms antennal or flagellar segments are used instead of flagellomeres. Nearly all bees have a subantennal suture extending from each antennal socket down to the epistomal suture. If the antennae arise close to the clypeus, there may be no suban-tennal sutures, and in some bees (most Andrenidae) there are two subantennal sutures below each antenna, defining a subantennal area. These sutures are easily seen as dark lines if the integument is pale but are often hard to see if it is black, and may be invisible if it is both black and coarsely punctate. The epistomal suture defines the upper limits of the clypeus. A longitudinal carina immediately mesal to the antennal base occurs in some bees. Typically, it is most elevated just above the antennal base and often forms a lamella that partially overlaps the antennal base (Fig. 10-3a). Such carinae are often called interan-tennal or interalveolar carinae. Such terms, however, suggest carinae extending from one antennal base to the other. The term juxtantennal carinae, proposed by Michener and Griswold (1994a), is therefore preferable for these structures. nal distance (or length of subantennal suture if it is straight); (7), length of eye; (8) interantennal or interalveolar distance; (9) intero-cellar distance; (10) ocellocular distance; (11) antennocellar or alveolocellar distance; (12) antennocular or alveolocular distance; (13) clypeocular distance; (14) length of malar area. c, Antenna of female bee. From Michener, McGinley, and Danforth, 1994.
gled or lobed down into the clypeus on each side. The resultant lobe of the paraocular area into the clypeus is called the paraocular lobe (Fig. 10-3a). The term orbit is often used for the eye margin, inner orbit for the frontal or facial margin, and outer orbit for the genal margin. An expression like "eyes converging below" is ordinarily exactly equivalent to "inner orbits converging below." Imaginary lines tangent to the upper or lower extremities of both eyes, as seen in a frontal view of the head, are sometimes useful in indicating the positions of the ocelli or of the clypeal apex. Such lines are called the upper and lower ocular tangents. Descriptions of bees often include measurements or, more often, statements of relative dimensions of various structures, especially on the head. Figure 10-3b indicates how certain measurements should be made. Looking down on the vertex, one can use the postocular tangent, the imaginary line tangent to the posterior convexities of both eyes. The ocelloccipital distance is between a posterior ocellus and the point where the vertex curves or angles down onto the posterior surface of the head, i.e., usually the preoccipital ridge. Several of these terms can be reversed, e.g., ocellocular has the same meaning as oculo-cellar. The genal area is the region behind the eye and in front of the preoccipital ridge. The ridge surrounding the concave posterior surface of the head above and laterally is called the preoccipital ridge. A carina sometimes found on this ridge is the preoccipital carina. It can be dorsal (behind the vertex only), lateral (behind the eye only), or complete (both dorsal and lateral). According to Silveira (1995a), the dorsal part of the preoccipital ridge in some Exomalopsini is actually on the posterior surface of the head, and a new transverse ridge (or carina), the posto-cellar ridge (or carina), is present just behind the ocelli. The proboscidial fossa (Fig. 10-1) is the large, deep nal distance (or length of subantennal suture if it is straight); (7), length of eye; (8) interantennal or interalveolar distance; (9) intero-cellar distance; (10) ocellocular distance; (11) antennocellar or alveolocellar distance; (12) antennocular or alveolocular distance; (13) clypeocular distance; (14) length of malar area. c, Antenna of female bee. From Michener, McGinley, and Danforth, 1994.
groove on the underside of the head into which the proboscis folds. The fossa is margined laterally by the hy-postomal carina, the anterior end of which bends laterad behind the mandibular base. The underside of the head, lateral to the hypostomal carina and behind the mandibular base, is the hypostomal area, or, according to Eickwort (1969b), the postgena; this area is not the entire hy-postoma because the latter includes also the walls and roof of the proboscidial fossa. The paramandibular process is an anterior projection of the hypostoma that approaches, butts against, or is fused with the lateral part of the clypeus, and in the latter case provides sclerotic closure of the mandibular socket. Bristles or hairs arising from a ridge on the paramandibular process and sometimes continuing laterally on the lateral extremity of the hypostomal carina constitute the subgenal coronet of some An-drena species. Figure 10-4. Diagrams of proboscides of bees. a, Spread proboscis of a long-tongued bee; b, Maxilla of the same; c, Labium of a short-tongued, in this case colletid, bee, showing portions of maxillary cardines at the base; d, Maxilla of the same. From Michener, McGin-ley, and Danforth, 1994.
tend back on the ventral surface of the body to or even beyond the apex of the metasoma. The proboscis is extended, for example to probe a flower for nectar, by unfolding these segments. It can project downward from the bee's head, or forward. For descriptive purposes I consider it to project downward, but some other authors make the other decision. What I consider the anterior surface of the proboscis, they call the dorsal surface. Proboscidial structures are illustrated and labeled not only in Figure 10-4 but also in Figures 19-1 and 19-2. The terminology of the parts of the glossa is extensive and is indicated in Figures 19-3 and 19-4. The galeal blade, i.e., the postpalpal part of the galea, is divided by a longitudinal galeal rib into (1) a thin, anterior, hairless part, its sclerotized surfaces compressed together (Roig-Alsina and Michener, 1993, fig. 15), called by J. Plant (manuscript, 1991) the galeal velum; and (2) a posterior part that supports hairs, and whose inner and outer surfaces are largely separated. In S-T bees the apices of these parts are commonly separated by a notch near the apex of the galeal blade. The galeal rib, which often bears a series of hairs, appears as a strengthening element, principally in L-T bees. The prepalpal part of the galea is the subgalea. 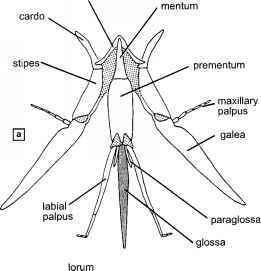 There has been confusion about the naming of the basal sclerites of the labium. The main labial sclerite, which is in the middle "segment" of the labium and to which the labial palpi are attached, is regularly called the prementum. 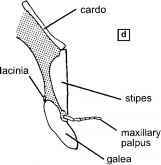 Basal to the prementum, and supported in the membrane between the apical parts of the maxillary cardines, are one or two sclerites that can be called the postmentum. In most Hymenoptera there is only one such sclerite. In many bees there is a sclerite immediately basal to the prementum that tapers basally and is thus more or less triangular. This is what I call the mentum (Michener, 1944, 1985a), following Snodgrass, who, however, in 1956 called it the postmentum. Plant and Paulus (1987) consider it the distal part of the postmen-tum, the basal part being the lorum. In some bees the mentum is partly (as in some Andrena and Panurgus) or wholly (as in Ctenocolletes, some Andrena) membranous (Michener, 1985a), but can be identified by its position and shape. In other bees, such as the Halictidae, the membranous area is smaller, not so distinctively shaped, and may represent either the reduced mentum or merely a membrane between the prementum and the postmen-tum. Basal to the mentum, in most bees, is the lorum. 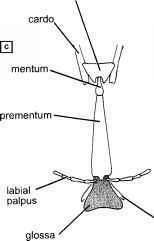 It was called submentum by Michener (1944), but Winston (1979) and others pointed out that because there is only one basal labial sclerite in other Hymenoptera, the lorum should be considered a new structure, special to the bees, not homologous to the submentum of some other insect orders. Plant and Paulus (1987), however, as indicated above, regarded it as the basal part of the postmentum. For convenience, I term the labial sclerites, starting basally, to be lorum, mentum, and prementum. When the lorum expands as a weak sclerotization occupying space between the cardines, I call it the loral apron. When, as in most Halictidae, the mentum is partly or wholly membranous and doubtfully recognizable, I nonetheless tentatively regard the single basal labial scle-rite as the lorum and loral apron, not as a fusion product of lorum plus mentum. These sclerites are fused in some L-T bees, but this is not as common or so evident as was indicated by Plant and Paulus (1987), who illustrated quite distinct sclerites as fused in some cases. The basal part of the proboscis, i.e., the part that attaches to the head, is called the labiomaxillary tube (stippled in Fig. 21-2). Its skeletal parts are the cardines, which are strong rods in the wall of the tube, and it is further strengthened by flexible strips called the conjunctival thickenings. (Additional longitudinal thickenings on the anterior surface are of maxillary lacinial origin in the Halictidae.) For illustrations, see Figures 21-2b and 59-1. In many bees the lower end of the conjunctival thickening is separated as a small sclerite, the suspensorium of the prementum, that connects the thickening to a lateral notch in the prementum. In the posterior surface of the labiomaxillary tube, the lorum varies greatly, as described above and by Michener (1985a). It may be a rather weak, flat loral apron, i.e., a thickening or sclerotization of the posterior wall of the labiomaxillary tube occupying most of the space between the cardines. It may be more limited in area but elevated around the connection to the men-tum, or reduced to a strongly sclerotized, V-shaped structure connected medially to the mentum (Fig. 10-4a). In the last two alternatives, when the labium is retracted, the base of the mentum and median (apical) part of the lo-rum together commonly project, forming a lobe extending posteriorly from the labiomaxillary tube. This lobe is the proboscidial lobe (Fig. 21-2a). In some bees, when the proboscis is retracted, this lobe projects upward and into the postoccipital pouch, a large pit below the foramen magnum (Roig-Alsina and Michener, 1993). The thorax. The bee thorax (Fig. 10-5) is a compact structure consisting of sclerites of the pro-, meso- and metathoracic segments, which bear the legs and wings, and the first true abdominal segment, termed the propodeum. The prothorax is represented primarily by the large pronotum, which extends ventrally at each side as a process that meets or nearly meets its fellow behind the fore coxae. The propleura and prosternum are in front of this lateroventral extension of the pronotum. The pronotal lobe is a useful landmark. The dorsolateral angle of the pronotum is in front of and somewhat mesad from the pronotal lobe; often there is a ridge, carina, or lamella connecting the lobe to the dorsolateral angle. Sometimes a ridge, carina, or elevated zone extends between the two dorsolateral angles along the posterior margin of the pronotum; this is the pronotal collar. Another ridge or carina may extend directly downward from the dorsolateral angle toward the front coxa. In dorsal view, the mesothorax can be divided into four distinct sclerites: the scutum, the scutellum, and the paired axillae. The suture between each axilla and the scutellum is the axillar suture; other sutures in this area are easily recognized by name, e.g., scutoscutellar. Laterally, the mesothorax is represented by the mesepister-num, sometimes referred to as the mesopleuron. The mesepisternum is sometimes divided by the nearly vertical episternal groove, formerly called the pre-episternal groove. The episternal groove may extend down, after meeting the anterior end of the horizontal scrobal groove, onto the lower anterior part of the mesepister-num, as in most Colletinae and Halictinae (Fig. 20-5b); it may curve posteriorly in an arc that merges indistin-guishably with the scrobal groove as in Andrena and many Apinae (Fig. 20-5c); or it may be absent (Fig. 20-5a) or so short as not to reach the scrobal groove, as in the Megachilinae. The scrobe is a small pit on the scrobal groove in front of the meso-metepisternal suture. The area above the scrobal groove and behind the episternal groove is often more convex and shiny than adjacent areas; it is the hypoepimeral area (not labeled in Fig. 10-5). The depressed and largely hidden anterior margin of the mesepisternum is the prepectus, according to Brothers (1975). The lateral (as distinguished from ventral) part of the mesepisternum is divisible into an anterior-facing surface and a lateral-facing surface. The angle between these surfaces varies from gradually rounded (Fig. 20-5a) through sharply angular to carinate and even lamellate. To avoid expressions like "angle between anterior and lateral surfaces of mesepisternum," Michener and Griswold (1994a) introduced the term omaulus for this angle. For sphecoid wasps, "omaulus" is used only if the angle is carinate; for bees the term is broadened and used even if the angle is rounded, so that one can record "omaulus rounded" or "omaulus carinate," or even "omaulus lamellate." The omaulus, which is not shown in Figure 10-5, is anterior to the episternal groove when the groove is present, and the preomaular area is anterior to the omaulus, i.e., it is the anterior, forward-facing surface of the mesepisternum. Dorsally, the metathorax consists of a sclerite, the metanotum, which is obliquely divided at each side by the transmetanotal suture. The metepisternum (or metapleuron) forms the lateral surface of the metathorax. The wing bases are located above the upper margins of the mesepisternum and the metepisternum. Figure 10-5. Diagrams of a bee's thorax. a, Lateral view; b, Dorsal view. (The tegula is omitted in a and the left side of b. The propodeal triangle is indicated by dotted lines in b.) From Michener, McGinley, and Danforth, 1994.